I LOVE anything chromatic, iridescent or sparkly… so naturally, I decided to test these two gorgeous products at the same time! 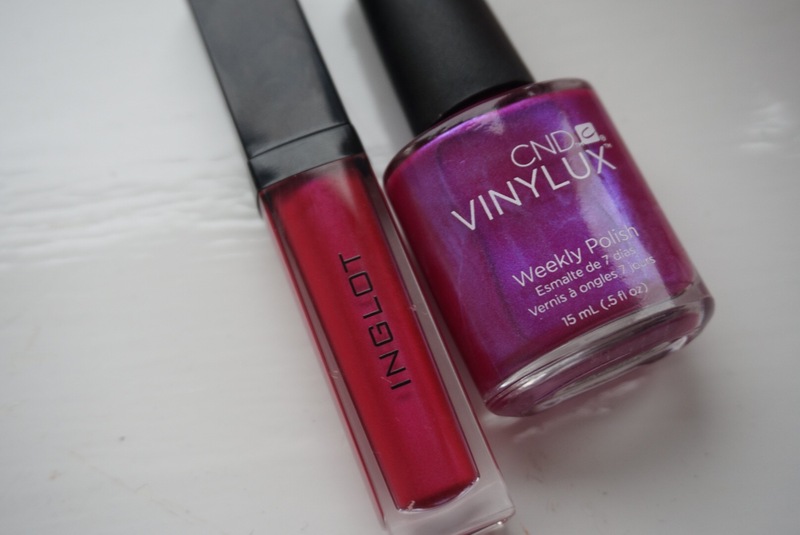 I’m so grateful that the Inglot UK team decided to send me this Inglot Diamond Lip Tint Liquid Lipstick in ‘102’, along with a few nail varnishes which I’m yet to review! At first, I thought the lipstick would be like every other reflective, metallic lipstick I have tried in the past – extremely drying and never as impactful as you’d imagine. The formulation dried matte but DIDN’T dry my lips – in fact they felt extremely nourished by the end of the day. The all over colour is a vibrant pink and the sheeny areas have a light purple tint to them… you really have to see the lipstick in person to get the full effect! Anyway, it’s fair to say that I’m really impressed by the long-lasting power and colour pay-off, meaning I might have to get a few different colours to try (there are an additional 9 shades to choose from)! Where the nails are concerned, I am wearing the beautiful CNC World Weekly Polish in Magenta Mischief. For the record, this colour is beyond beautiful and the polishes are fairly expensive, so have become accredited for standing the test of time. For some reason, whenever I apply nail varnish (even if I leave it to dry for hours and apply thin layers) it chips the next day… I have the the worst luck. If you guys have any tips, I’d love to hear them! Regardless, I’m obsessed with my nails and keep turning them towards the light and seeing different tones of pink and purple… sooo pretty! P.S. Guys, I’m so close to 1,500 followers… you’re the best!